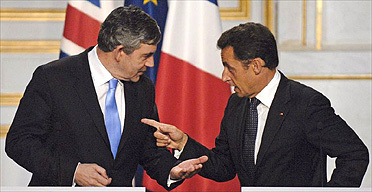 OLDRIGHTIE: Does Sarkozy trust Gordon? Little reported but this sarcasm from Monsieur "Sarky" Sarkozy seems to suggest that at least one European Leader has Snotty sussed for the two faced moron he is. Shame 31% of our electorate don't have a clue as to how bad things are. I suspect most people, including Obama have him "sussed".